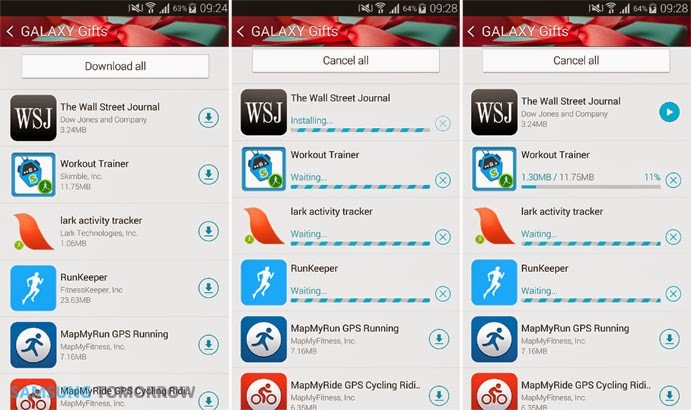 Galaxy Gifts refers to a content offering that comprises a wide variety premium mobile services collection and tools for enhancing every user's mobile experience. It is available prepaid or discounted. Galaxy S5 owners could get the Galaxy Gifts offer of over $600 worth of applications and subscriptions. The service is also offered to other Samsung Galaxy devices, including the Galaxy NotePRO and Galaxy TabPRO. Offerings could vary on these devices. The Galaxy Gifts does not come pre-loaded on the Galaxy S5 handset. This means the need for you to enable this service on your phone for the first time. If you want to get such cool apps on your phone, then you need to download them first, otherwise, do nothing. 1. Tap on the widget to get started. Once the widget is opened, you will be prompted with a disclaimer page. Read it over and agree to proceed. 2. After getting past the disclaimer, you will be prompted with a new screen, containing a list of 16 apps. 3. Go through the list of applications and see which of these apps you want to have on your device. But before you go ahead and download a certain app, be sure to check out the deals for each of them. 4. Once you've decided to get the app, click on the Download icon (represented by a down-pointing arrow) on the right side. The download process should now instigate. Wait until it's all done. 1. Begin by opening Samsung Apps. A separate Galaxy Gifts category is also available for eligible users. Tap that and follow the on-screen instructions that prompt to walk you through the installation of the Galaxy Gifts. 2. Wait until the installation is finished and then open or access Galaxy Gifts afterward. The Galaxy Gifts automatically recognizes available applications through the Galaxy Gifts, so all you have to do is enjoy the deal. The full list of a deal will also be provided so you don't have to search for it. 1. Tap Apps from Home. 2. Inside the Application page, look for the icon on the upper right corner and then tap on it. 3. Select Uninstall App from the given options. This will lead you to a page full of apps icons. 4. Select the app you want to delete. Wait until the phone is done deleting the selected app and that should now be removed from the apps list. Here's a list of Galaxy Gifts offers for Samsung Galaxy S5 owners, so far.